A Rockin' Good Time at the EcoDrama Festival! 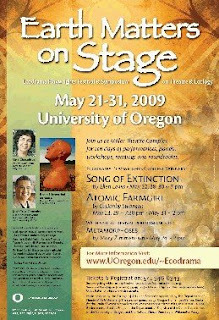 I've just returned from Eugene, Oregon, where I was attending the "Earth Matters on Stage" EcoDrama Festival. What a wonderful trip! Here are a few pictures. 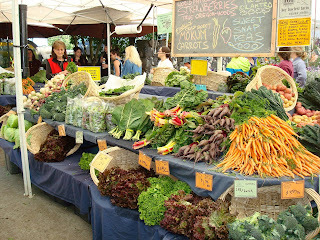 The wonderful Farmer's Market in Eugene -- I listened to music, walked around all the booths, had lunch, saw a woman with a tame skunk, and bought fresh-picked straw- berries to carry with me on my bike ride. 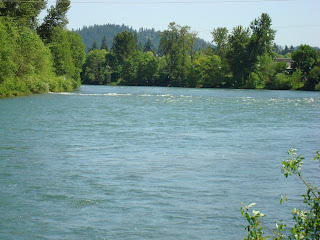 The Willamette River. I rented a bike and rode on Saturday and Sunday. 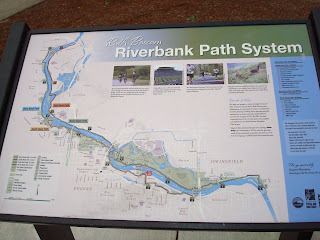 The path takes you down one side of the river and back the other. 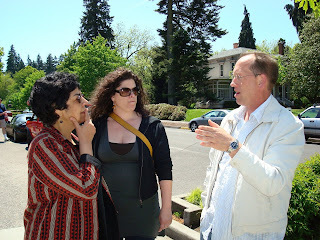 Una Chaudhari (NYU teacher and scholar), C. Denby Swanson (playwright: Atomic Farmgirl) and John Schmor (U of O Theater Department Head). 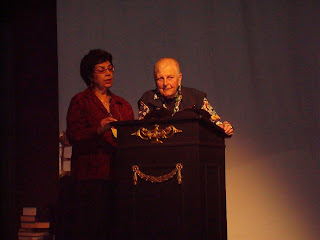 Una Chaudhari with Rachel Rosenthal, who talked about (and showed clips from) her theatrical activism. 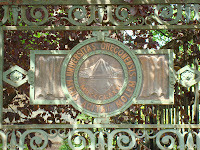 University of Oregon's motto, written on their front gate: Mens agitat molem. The mind moves the masses. 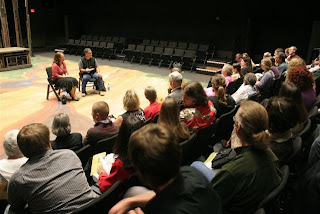 Me in the hot seat, with playwright Jose Cruz Gonzalez moderating, at the talk-back after the first performance of "Song of Extinction" at the EcoDrama Festival. Discussed my Friday night talk-back on the phone (at 9am) with Jose Cruz Gonzalez, who will be moderating (and seems really nice). Returned a couple dozen e-mails. Checked on the ticket situation for my Mom again. Called her, and e-mailed her, to reassure her that there will be tickets and all will be well. Looked up and e-mailed parking information, directions and a map to U of O to my folks (who will be coming with an entourage of relatives and friends to Friday night's performance). Passed keys and cat care information to my awesome friend Stephanie, who has agreed to take care of Joe. Highlighted important events on the EcoDrama schedule. Lots of fun stuff to do! And hopefully some time to walk by the river and write and hang out, too. I still have to pack (washed clothes last night, though), wash dishes, wash car, put registration stickers on car, talk with YPF mentee, talk to a man about a reading, load final draft onto laptop, find sleeve of final draft disk so I can load software, and probably seven other things. I watered the plants last night. What am I forgetting? I love being other places... but the "getting out the door" part makes me a little crazy. Soon! I'll be there soon! I can't wait to spend the whole long weekend BEING A PLAYWRIGHT. It's not that I'm not a playwright the rest of the time. Now, finally, I do think of myself that way, even if I AM a playwright with a day job. But... the gift of time and immersion into one's passion, alongside other passionate, immersed people, is tremendous. Thank you, EcoDrama people! I can't wait to meet you, and work with you, and be part of what you're making happen. From NASA: "Astronaut Andrew Feustel works on the Hubble Space Telescope in this image from NASA TV May 18, 2009. Shuttle Atlantis astronauts returned to the Hubble Space Telescope on Monday for a final spacewalk to install fresh batteries, thermal shields and a sensor to pinpoint celestial targets for research. 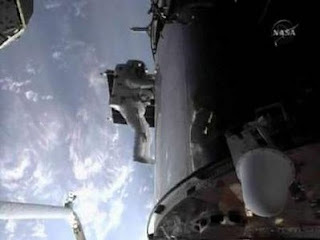 Lead spacewalker John Grunsfeld and Feustel left the shuttle's air lock at about 8:30 a.m. EDT (1230 GMT), almost an hour ahead of schedule." 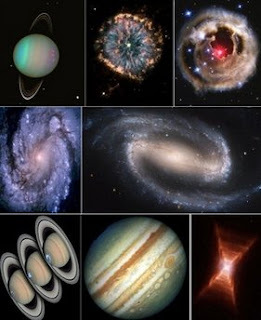 Pictures from the Hubble telescope, through the years. Aren't they pretty? "In the mail a letter from a twelve-year-old child, enclosing poems, her mother having pushed her to ask my opinion. This child does really look at things, and I can write something helpful, I think. But it is troubling how many people expect applause, recognition, when they have not even begun to learn an art or a craft. Instant success is the order of the day; "I want it now!" I wonder whether this is not part of our corruption by machines. Machines do things very quickly and outside the natural rhythm of life, and we are indignant if a car doesn't start at the first try. So the few things that we still do, such as cooking (though there are TV dinners! 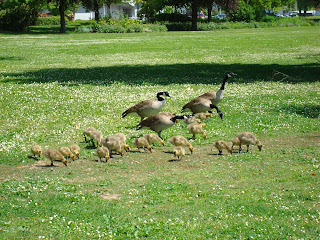 ), knitting, gardening, anything at all that cannot be hurried, have a very particular value." Saw: A polo game, several beetles, some nice wildflowers. Birds. Fog rolling in over the green hills. 2 miles round trip with a 300-foot elevation gain. The monthly "Our Town" paper -- which covers events and activities from the area in rural Oregon where I'm from -- did a little feature article about me. Home town girl makes good. Growing up in rural Oregon, on a small farm, was really wonderful. We didn't have a lot... but then again, we did. Trees to climb. Space to run around in. A creek to wade in, shrieking when we saw crawdaddies. Berries to pick. Chickens to feed. Grandparents just down the road. Cats to carry around. Books from the local library. A small school where everyone (in all nine grades) knew your name, or at least who your folks were. Nice article here about a bit of theater magic -- a set transformation that happens during the intermission that speaks volumes about the story. A stage picture is worth a thousand words, or something like that. My brother told me, once, about a production of Who's Afraid of Virginia Woolf? that he saw back east, where in each act the set was more broken and spare than the last, so the end of the play was done on practically a bare stage -- an idea that knocks me out just to think about. I remember a pivotal production of Bent that I saw in Portland when I was in college (pivotal for me as a writer and a human being)... I'd hardly been to a play before, not really. Not if the ones I was in myself in high school don't count. It was a small theater. During the time when the hateful Measure 9 was being hotly debated everywhere. And the small theater had been transformed into pre-War Germany -- flags on the walls around us, tinny German music, as if over a phonograph, and two Nazi soldiers positioned behind the audience for the duration of the play, as if we were held prisoner in the story ourselves. What's your favorite use of set or space to tell a story for the stage? Labels: Bent, set, theater magic, Who's Afraid of Virginia Woolf? First read through of Heads, which is going to be part of Halcyon Theater's Alcyone Festival in Chicago in June/July 2009. From left to right, director Jessica Hutchinson and her cast: Kerry Cahill, Miguel Nunez, Arch Harmon, Pat King. It's exciting seeing actors tackling one of my plays, in a reading and even more so in a production. How flexible is the text? What do the voices in my head sound like when they're in someone else's body? I look forward to meeting these nice folks during their run, although I haven't figured out the exact date yet when I'm going to Chicago. It's kind of strange to see my plays moving farther afield. I've been in contact with these folks, of course. With Tony (artistic director of Halcyon Theater) and with Jessica (director of my play) through e-mail. E-mail is wonderful. We can go back and forth, Qing and Aing. But I'm not there. It didn't bother me -- I hardly gave it any thought -- with my short plays. I have a LOT of ten-minute plays and a few one-acts, and I blithely send them out into the world. I'm happy to hear reports back, and I love to get pictures. What fun to see what a play looks like when it's done in San Diego with two men versus in Shanghai and Los Angeles with a man and a woman versus in Canada, set in an actual book store (like Lend Me a Mentor). It's fun. I'm happy to hear reports back. Full length plays, though... It's a little harder to let go of them. Writing a full-length play is like taking pieces of yourself and smooshing them, red and bloody, on the page. (Perhaps you discern, here, if you don't know me well, that I don't tend toward comedy-writing. ) The writing of a full-length play (the research, the writing, the readings, the rewriting) often takes a year or more to complete. No matter how fictional a full-length play is, I don't know how it *couldn't* contain a lot of the writer in it. The "giving birth" metaphor is apt. And I'm delighted, really delighted, to see my plays moving outside of myself, and going places where I've never been, and doing things beyond me. Delighted!! Just... separation anxiety, I guess. I want the best for them, you know? Live long and prosper, little play! May these nice people in Chicago take good care of you, and have a real good time making you shine on their stage. When writing plays, I find myself using my walls more and more. I need that larger canvas to free associate on, taping up pictures and bits of research and pieces of dialogue, and moving them about as the play forms itself in my mind. Rubbing things against each other, and seeing where sparks fly. Such a fun business, this messing about! Interesting article here about non-fiction writer Gay Talese, who is writing a book about his marriage to editor Nan A. Talese in this, their 50th year of marriage. The article intrigues me. After writing books about everything from the sexual revolution to his own Italian heritage, he is now focusing on his relationship with his wife. She says he knows very little about marriage (after fifty years). They've both stuck it out for a long time, and through lots of public opinions about their very public "private" life. He has written about everything he's done, and they've stuck with each other despite all. People will have opinions. But no one knows how a marriage works outside that marriage. It will be interesting to see if he'll be able to tell it. Because I think you can be pretty blind from the inside, too. 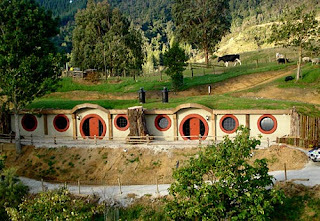 I always wanted to live in either a tree house or a hobbit house.